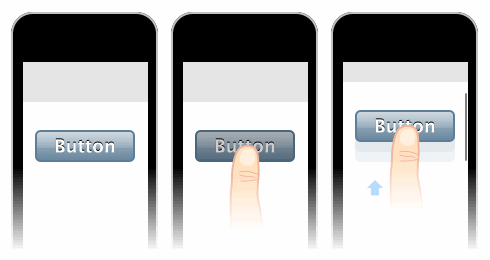 A simple, standalone library to invoke the tap event for touch-friendly web browsers. Tappable is a simple, standalone library to invoke the tap event for touch-friendly web browsers. Currently it's only tested on iOS Mobile Safari as I don't have any other smartphones to test with. The codebase is heavily inspired by Matteo Spinelli's Remove onClick delay on webkit for iPhone and Ryan Fioravanti's Creating Fast Buttons for Mobile Web Applications. When the page scrolls, the button is not tapped. The second case is the noScroll mode, where moving your finger on the element will not make the page scroll. This is useful for mobile web apps which might implement their own fixed headers or sections on the page. The button is tapped when the finger is on top of the button, even after moving in and out. selector - (string) The CSS selector expression of element to be tapped. opts - The options object or a function. (object) The options to be passed. (function) The function to execute when tapped. noScroll - (boolean: defaults to false) Whether or not to scroll when moving on the element. activeClass - (string: defaults to tappable-active) A string indicating the active class applied to the element. onTap - (function) The function to execute when tapped. onStart - (function) The function to execute when touchstart event is fired. 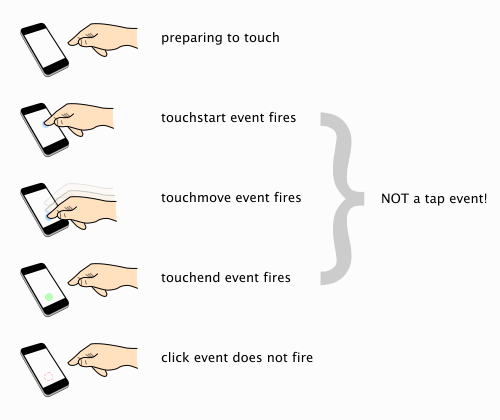 onMove - (function) The function to execute when touchmove event is fired. onMoveOut - (function) The function to execute when touch moves out of the element, if noScroll is true. onMoveIn - (function) The function to execute when touch moves back in the element, if noScroll is true. 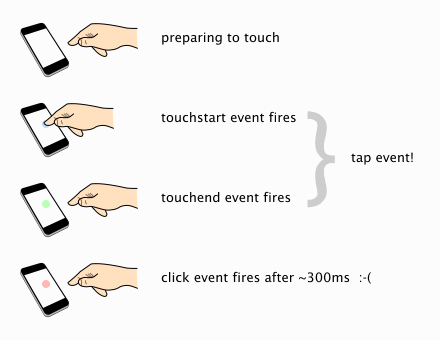 onEnd - (function) The function to execute when touchend event is fired. onCancel - (function) The function to execute when touchcancel event is fired, or when touch moves if noScroll is false. allowClick - (boolean: defaults to false) Whether or not to preventDefault the click on the element. boundMargin - (integer: defaults to 50) A number indicating the bounding area of tapped region (of the element). noScrollDelay - (integer: defaults to 0) A number indicating the delay in ms before 'noScroll' option kicks in. activeClassDelay - (integer: defaults to 0) A number indicating the delay in ms before the active class is applied. inactiveClassDelay - (integer: defaults to 0) A number indicating the delay in ms before the active class is removed. Note: This is no longer needed. The latest code now does event delegation by default. For (almost) every callback function, a second argument which is the target element node, is passed. As a bonus, the event object also have an additional target attribute which is the target node (can be any node type, not just element node). Feel free to fork this project! Help and feedback would be appreciated, especially if this could be tested on Android, WebOS or any other touch-friendly browsers, not just mobile ones. Tappable is licensed under the MIT license.